Are Pay-TV Providers Getting Hit By a Perfect Storm in Q3? The U.S. pay-TV industry, which as a whole lost multichannel video subscribers for the first time in Q2 '10, may be heading for a soft 3rd quarter as well. As Multichannel News reported yesterday, Time Warner Cable's CFO Rob Marcus said at a conference this week that Q3 "video net losses are pacing ahead" of where they were in Q3 '09. He attributed the downturn to recession-related factors of high unemployment, high home vacancy rates and slow new home formation. Though that's a fair explanation, it's only one element in a perfect storm pay-TV operators now find themselves battling. Aside from the above recession-related matters, pay-TV operators are also up against belt-tightening that's rooted in basic household economics. 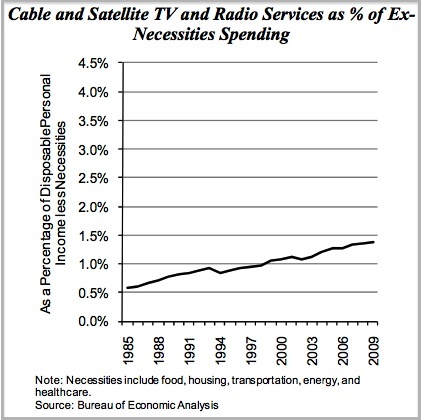 As Craig Moffett at Sanford Bernstein pointed out in a note last weekend, in the past 25 years, cable and satellite spending has increased from 1/2 of 1% of discretionary spending to 1.4%, a growth rate that's triple other household discretionary line items. This spending increase has been helped along by rising incomes, decreasing savings rates and spending shifts away from adjacent categories like video rentals. But now this dynamic has flipped: income growth has turned negative and savings rates are increasing. As a result, cable and satellite industry reliance on price increases to propel top-line growth aren't sustainable. Moreover, the household-level financial squeeze inevitably leads to pay-TV subscribers closely examining the monthly bill, with an eye to dropping less valuable services (e.g. premium channels, additional set-top boxes, etc.). This is turn may help explain HBO's lower subscriber count. The timing of subscribers' closer spending scrutiny is exacerbated by the recent prevalence of inexpensive or free over-the-top video choices. With millions of people now freely watching broadcast network shows on Hulu or the network sites, a new realization is dawning that there's a lot of good stuff available online. In addition, paid services like Netflix and Redbox provide inexpensive augments to free. And whereas online viewing has been handicapped by being tethered to the computer, the proliferation of cheap connected devices (e.g. Apple TV, Roku, boxee, Blu-ray players, gaming consoles, etc.) means convenient TV-based viewing of online delivered content is just ahead for millions of households. Some of the earliest effects of the recession/belt-tightening/online viewing dynamic are likely playing out with one specific segment that has reliably delivered seasonally-strong Q3 subscriber gains for the many pay-TV operators: college students. While it's admittedly anecdotal, I've heard several stories in the past few weeks of cost-conscious parents declining to fund pay-TV subscriptions in their college-age kids. It turns out the kids aren't pushing hard for pay-TV anyway; they're accustomed to watching what catches their fancy online or not watching at all, with their attention diverted to Facebook, Twitter, YouTube or other pursuits. Add it all up and the pay-TV industry is facing a perfect storm in Q3 '10. When the financial results start coming in, it's likely we'll see a continuation of the softness that began in Q2. While it's tempting to attribute all of the weakness to the recession, there are other factors at work as well. How the pay-TV industry chooses to react to these newly challenging circumstances will say a lot about its future prosperity.